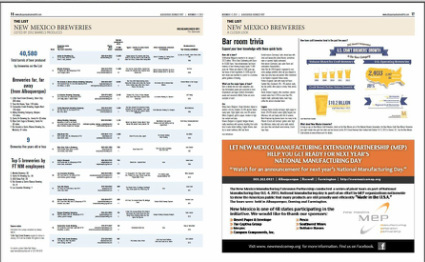 Breweries: New list that required finding all New Mexico breweries with contacts and email addresses plus convincing them to complete the surveys since they had no knowledge of the list's advertising value. Conventions and Events: Developed from a list provided by the Albuquerque Convention and Visitors Bureau. I found conventions and events that the Bureau left off their list as they were not directly involved. This made the list more accurately reflect economic impact. Giving Guide: Through my research, I found 66 non-profits that had not been on previous years' lists and determined contacts and email addresses previously missing. Labor Unions: Included contacts for first time since list was initially published. Office Buildings: Researched histories to provide more detail for the buildings selected for A Closer Look. Oil and Gas: Expanded previous A Closer Look sections to detail production's effect on New Mexico economy. Wineries: Found free use charts to illustrate wine "fun facts."